Essential Skills for a Medical Teacher is a perfect introduction for new teachers to the exciting opportunities facing them, whether they are working in undergraduate, postgraduate or continuing education. It will also be of considerable use to more experienced teachers to review and assess their own practice and gain a new perspective on how best to facilitate their students' or trainees' learning. 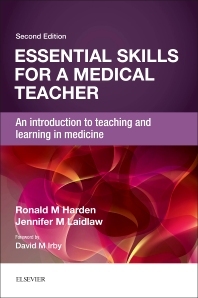 The contents are based on the authors’ extensive experience of what works in medical education, whether in teaching and curriculum planning or in the organisation of faculty development courses in medical education at basic and advanced levels. The text provides hints drawn from practical experience to help teachers create powerful learning opportunities for their students, providing readable guidelines and introducing new techniques that potentially could be adopted for use in any teaching programme. Throughout the book introduces some key basic principles that underpin the practical advice that is given and which will help to inform teaching practice. This book will assist readers to reflect on and analyse with colleagues the different ways that their work as a teacher or trainer can be approached and how their student or trainee's learning can be made more effective. "In this book, the authors serve as readers' personal faculty development coaches. They provide a concise summary of the most important points a teacher must consider when engaging with learners and provide practical examples from their own personal and professional lives that add interest. The topics are relevant for all medical educators and are wonderfully integrated throughout the various sections and chapters of this faculty development resource. Although appropriate for any medical educator, this book is perhaps particularly valuable for those who are new to medical education or are working to improve their curricula and approaches to learning and assessment."